Opel: After 80 years as part of GM, what's next? BERLIN (Reuters) -- The German government has decided to give Fiat and Magna preferred bidder status for General Motors Opel unit and grant them access to the automakers books, according to a report in German daily Die Welt. The newspaper, citing sources close to talks taking place in the German Chancellery today, said the two other bidders, RHJ International and China's Beijing Automotive Industry Corp., would be allowed to further develop their offers. 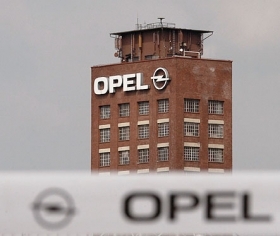 The report emerged as Germany scrambled to put a plan in place to protect Opel from a looming bankruptcy filing by parent GM. A government official, who requested anonymity, said the report was not fully accurate but declined to elaborate. No one was immediately available in the German government to comment officially. Members of German Chancellor Angela Merkel's government were meeting with Opel suitors in Berlin in the hope of narrowing the field of bidders and clinching a deal to separate Opel assets from GM and provide the European firm with financing until a deal can be closed. Italy's Fiat S.p.A, Canadian auto-parts company Magna International Inc., Belgium-listed holding company RHJ and Beijing Automotive are vying for Opel, and Germany has been pushing all four to improve their offers. In addition to examining the bidders, Germany must also win approval from the U.S. government and GM for its plan to temporarily place Opel assets with a trustee, a step to protect its patents and technology from GM creditors who could swoop when the U.S. parent files for bankruptcy. "We need to see significant movement, both from the potential investors and from the U.S. government and General Motors," Economy Minister Karl-Theodor zu Guttenberg said. He said it was unlikely the government would settle on one single bidder at the Wednesday meeting, which was expected to continue until at least 11 p.m. (5 p.m. EDT). GM is expected to have the final word on who buys Opel, but Berlin will play a crucial role in the decision because it is being asked to provide billions of euros worth of loan guarantees as part of any deal. Opel traces its roots in Germany back to the 19th century and employs about 25,000 staff here in four plants. Its future has become the focus of a furious politically charged debate in Berlin ahead of a federal election in September. Like its parent GM, Opel has suffered acutely from the worldwide economic slowdown. Its sale would be part of an industry shakeout sweeping Germany and other carmaking countries across the globe. Fiat has presented an ambitious plan to fold Opel into a transatlantic car empire that would also include U.S. manufacturer Chrysler LLC. Magna wants to use Opel and other GM brands to make an aggressive push into the Russian market. Heading into the talks, these two offers appeared to have an edge over those of RHJ and BAIC, the Chinese group which submitted a late offer on Tuesday that the German government has said lacks the required detail. Germany has warned that insolvency remains an option if no offer is deemed suitable. It is considering offering Opel 1.5 billion euros ($2.09 billion) in bridge financing to tide the company over until a deal is finalized and wants the bidders to contribute funds. Excluding Saab, GM Europe employs some 50,000 workers. It has car manufacturing plants in Spain, Poland, Belgium and Britain, where Opel cars are sold under the Vauxhall brand, as well as engine and parts sites such as Aspern near Vienna. Selling Opel was identified as a major priority by GM ahead of a June 1 deadline to restructure. The parent company's board could meet as soon as today to review options for GM, which has been kept in operation since the start of the year with $19.4 billion in emergency federal loans.